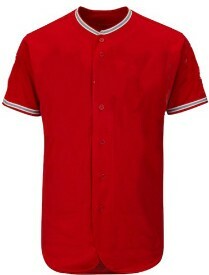 Customize uncrested MLB Full Button Baseball Jerseys online and get fast shipping. Try our Easy to use designer to add your artwork, photos, or text. Design something unique for yourself, school, company, tournament or team! No minimum quantity. Choose your product and customize it in minutes. Customize this blank major league Baseball Jerseys and get Super Fast delivery. Buy blank or add printing or embriodery. The Jersey fabric is snag and pull resistant. It has a long scoop tail from our pro-cut series and it is Anti-microbial with an authentic 5/32" sewn-on braid in stadium core fabric. You can also add custom names, logos, lettering and numbers or you can order blank.